If you are looking to be a Painter within the construction industry then you will be experienced in painting high volume and working to tight deadlines. You may be painting warehouses from floors to walls and woodwork, metal etc but usually you will be brought in towards the end of a project to make the project look as it should before it is completed. You will be working with hard wearing and durable paints unlike paints in a house for example and will probably work with very similar colours and it will not be pattern or colour related like it would painting someone’s house. Painters starting salaries are around £14,500 and £17,000 a year. You can earn more once you have good experience. Employers would mainly look for experience when they are recruiting for Painter positions. 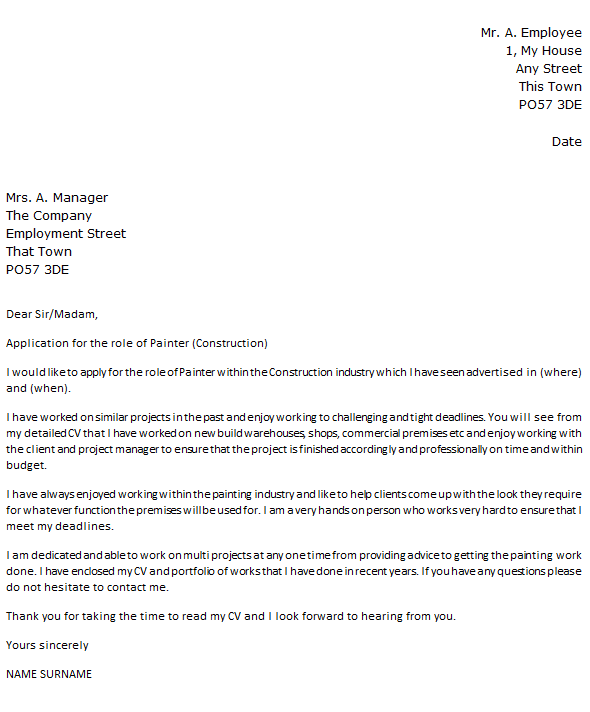 I would like to apply for the role of Painter within the Construction industry which I have seen advertised in (where) and (when). I have worked on similar projects in the past and enjoy working to challenging and tight deadlines. You will see from my detailed CV that I have worked on new build warehouses, shops, commercial premises etc and enjoy working with the client and project manager to ensure that the project is finished accordingly and professionally on time and within budget. I have always enjoyed working within the painting industry and like to help clients come up with the look they require for whatever function the premises will be used for. I am a very hands on person who works very hard to ensure that I meet my deadlines. I am dedicated and able to work on multi projects at any one time from providing advice to getting the painting work done. I have enclosed my CV and portfolio of works that I have done in recent years. If you have any questions please do not hesitate to contact me. Thank you for taking the time to read my CV and I look forward to hearing from you.